During the defense of a small fortress Osovets, located in what is now Belarus. Small Russian garrison was required to hold only 48 hours. He defended himself more than six months — 190 days! The Germans used against the defenders of the fortress are the latest weapon achievements, including aviation. At every defender had a few thousand bombs and shells. Dropped from airplanes and dozens of shells fired from the 17-year battery life, which included two of the famous "Big Bertha" (which in this case Russian managed to knock out). The Germans bombed the fort day and night. Month after month. 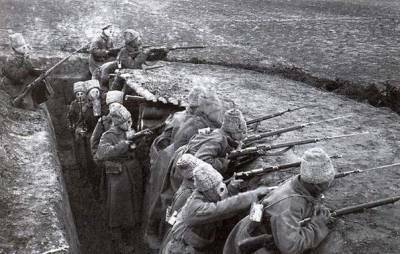 Russian defended among hurricane of fire and iron to the last. There were very few, but the suggestions of surrender has always followed the same answer. Then the Germans launched against the fortress of 30 gas cells. On the position of the thousands of Russian tanks struck a 12-meter wave chemical attack. Masks were not. All living on the territory of the fortress was poisoned. Blackened and withered even the grass. A thick layer of green poisonous chlorine oxide coated metal parts of guns and ammunition. At the same time the Germans launched a massive artillery bombardment. Following him to the assault Russian positions have moved more than 7,000 marines. It seemed like a fortress doomed already taken. Thick, like many German lines closer and closer … And in this moment of poisonous chlorine green mist has fallen on them … counter-attack! Russian was a little more than sixty. The remains of the 13th Company 226th Regiment Zemlyanskii. At each counterattacking had more than a hundred enemies! These warriors plunged the enemy in such a horror, that the Germans, not accepting the fight, rushed back. In a panic, trampling each other, confused and hung on their own barbed wire fences. And then at them with clubs poisonous fog struck, it would seem, is a dead Russian artillery. This battle will go down in history as the "attack dead." In the course of its dozens of half-dead Russian soldiers to flight 14 battalions of the enemy! Russian defenders Osovets never surrendered the fortress. It was abandoned later. And by order of command. When the defense has lost its meaning. The enemy has no patron, no nail. All surviving in the fortress of the German fire and bombs were detonated Russian sappers. The Germans decided to take the ruins just a few days.